May 7, 2018 May 6, 2018 / Elizabeth T.
This is so true, especially when it comes to fashion and styling. If you haven’t already noticed, it’s the accessories and details that often set a good ensemble apart from a great one, don’t you think? I’m always a firm believer of elevating my everyday looks with intricate details and trendy accessories because it’s what helps you stand out. When it comes to details and accessories, there’s definitely no shortage of choices, and this season there are 4 trends that I just can’t get enough of, especially when it comes to elevating an everyday outfit! Read on to see what they are! Though micro-sunnies seem to be getting most of the spotlight, let’s not forget that rounded sunglasses are also very trendy as well! If you’ve actually gotten yourself a pair of micro-sunnies, then you know they’re actually not that practical, since they’re more of a statement piece. Rounded sunglasses are a little different though, since they’re both fashion forward, yet functional! Since the lenses are much larger, they can adequately shield the eyes and the area around it. Plus, the retro rounded shape is super cute and really stands out amongst your normal aviators, don’t you agree? One of the most popular outerwear pieces for the spring is definitely the trench, but rather than just opting for a long trench coat, I thought a longline blazer would actually look pretty luxe and sophisticated, especially in white, don’t you think? The longer length gives a more masculine and strong look, but the white balances it and adds the right touch of subtle femininity to the ensemble. For an added touch of elevated elegance and sophistication, try draping the blazer over your shoulders, instead of putting your arms through the sleeves. This is perfect for the slightly cool spring days of LA, since wearing an actual blazer may make you feel too warm. As seen here, here, and here, I’ve been such a big fan of menswear inspired trousers lately! There’s just something about them that instantly makes any ensemble instantly more chic and sophisticated, don’t you think? Plus, I love how great they feel, since they’re usually looser, which means airier fabrics, especially for the warmer months! And of course, how can I leave out the leather mule loafers trend? I’m sure all of you are familiar with the super popular Gucci mule loafers by now, and I can honestly say that I’ve definitely hopped on to the bandwagon with this trend as well! Not only do they look super sophisticated and add that “high-fashion” element to just about any ensemble, these shoes are also super laid back and easy to just slip on, making them the perfect choice, especially on busy mornings! What are some of your favorite spring trends? And how do you like to elevate your outfits? Let me know in the comments because I always love hearing from all of you! Love the outfit! Cute pants doll! Thanks babe! ❤ 🙂 You're too sweet! Hahaha yesss, these essentials are a must in everyone’s wardrobe, right? ❤ 🙂 And I can't get enough of the round-frame this season! I love this look!!! I believe you’ve incorporated these trends so beautifully in it!!! Heheh thanks babe ❤ 🙂 Glad you liked this look! Thanks love! ❤ 🙂 And yesss, I'm such a huge fan of big round sunnies too! 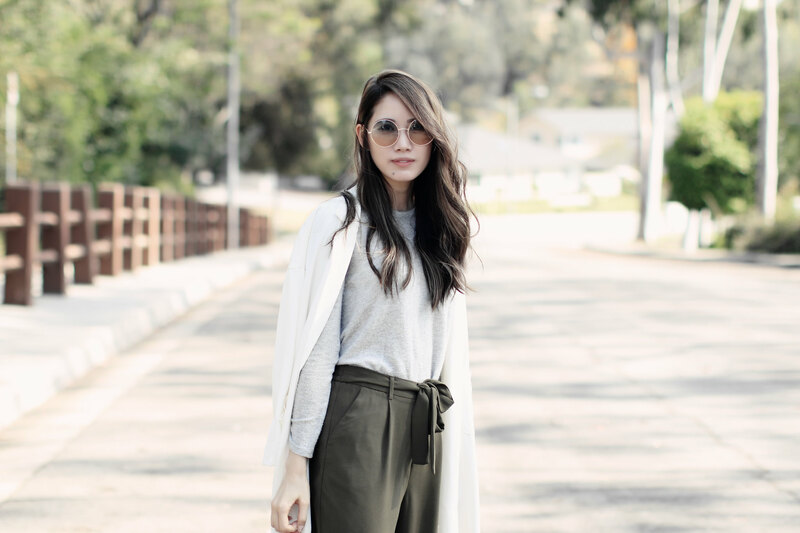 Gorgeous outfit and great tips on how to transform a look! Thank you so much love ❤ 🙂 Glad you liked the tips! Love the green trousers! been looking for a style like this. Perfect to pair with mules. I’ve been obsessed with these trousers and mules ❤ 🙂 So effortless and chic! These are total musts! I love your look. Thanks babe ❤ 🙂 I can't get enough of these spring trends! You absolutely nailed it with this outfit! Heheh you’re too sweet babe! ❤ 🙂 Thank you so much! I’m ready to try a pair of round sunnies! Thank you so much sweetie ❤ 🙂 You're too kind!